Keeping a natural grass lawn looking its best requires more time and effort than other ground cover options. For some homeowners, having a lush, green, natural lawn is well worth the effort, while others are beginning to move away from conventional grass to lower-maintenance landscaping options. When the issue is too much shade, you do not have much choice but to remove the object blocking the sun or pick another ground covering for that area. In some cases, you may have more success if you switch to a grass that requires less sunlight to thrive. In the case of gophers, voles, grubs or fungi, you will need to treat the problem before you fix the dead spots left behind. If critters are the issue, try these natural ways to ward off gophers and keep them from destroying your lawn. If the issue is grubs or fungi, head to your local garden center to pick up the appropriate treatment. Once you have treated the area (if necessary), it is time to repair your lawn. There is more than one way to repair your lawn, and you will need to determine which protocols are best for your situation. For example, if your lawn is thinning but still relatively healthy, you may be able to simply reseed the sparse areas to fill them in. However, if you have a patch of dead grass, you will likely need to remove the dead grass and replace it. Step 1: Mow your grass. Regardless of whether you are reseeding or replacing a patch with seed or sod, you will first want to mow the area in and around the patch. This will allow your new seeds or sod to receive optimal sunlight and better soil contact. Step 2: Clear the area. In most cases, you will want to completely clear the patch of any dead grass, weeds or other debris. You may need to cut the patch out by digging around the edges to remove the dead patch. Step 3: Turn the first few inches of soil. Your next step is to loosen the soil in the area to be replaced. You can achieve this by using a shovel or a rake to loosen and turn the soil. Mix in compost to add nutrients to the soil and get your seeds or sod on the road to success. If you are replacing the patch with sod, make sure you have dug the patch down far enough that it will be level with the surrounding soil. If you are replacing the patch with grass seed, make sure the soil in the patch is level with the surrounding areas. Step 5: Place your product. If your lawn repair involves sod, be sure to match the grass to your existing lawn. It may not seem like it will matter, but if you patch your lawn with a different type of grass, it will be very noticeable. 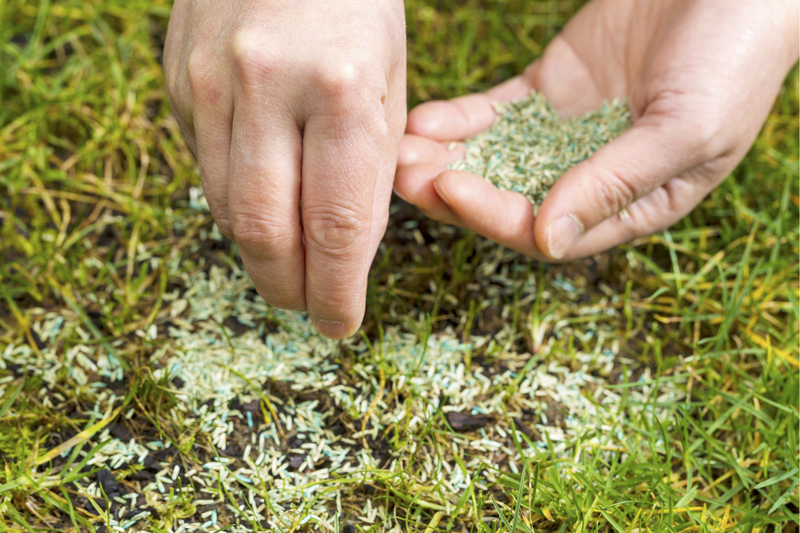 If your lawn repair involves seed, now is the time to spread the seed evenly over the patch area, and then use a rake to gently fold the seeds into the compost. If birds frequent your yard, they may eat the seeds, so you might want to protect the area by covering it with a thin layer of mulch or by installing reflective tape on stakes to ward them off. Remember to use seed that matches your existing lawn. Step 6: Water the lawn. You want to irrigate the patch enough to keep it constantly moist for at least the first week but not so much that you wash away the seeds or soil. You will likely need to water twice a day at first, and then move to once a day once your new patch begins to become established. Step 7: Hold off on mowing. It is okay to mow the rest of your lawn around the patches, but do not mow the new grass in the repaired area until it is at least three to four inches tall. You will know that it is okay to start mowing the new grass once it looks thick and healthy and begins to blend in with your existing grass.